Officers are addressing criminal behavior near 2nd St & Monroe. Please follow directions to move from the area. Phoenix Police Chief Jeri Williams says four people were arrested on charges related to the protest and one person was arrested on an unrelated warrant. Two officers were treated for heat exhaustion, she added. CBS affiliate KPHO-TV reports that two face charges of aggravated assault and one faces criminal damage charges. "They had their own gas and they threw it at police. They didn't throw our own gas," Williams said according to how an employee recounted the incident. Meanwhile, CBS News' Carter Evans was about three blocks away from the convention center and said his eyes and nose were burning. He said he saw a lot of flashes and heard bangs that seemed to disperse the crowd, but many were wearing masks. Evans reported that demonstrators were trying to send a message that they wouldn't stand for racism or white supremacy and disagree with much of what Mr. Trump stands for. CBS affiliate KPHO-TV described the scene as a "battle zone." "Your eyes are burning; you're choking," said KPHO-TV's Mike Watkiss, as he described how the gas affected him. In the following tweet you can purportedly see police shoot a rubber bullet after a demonstrator kicked a canister of gas back at them. 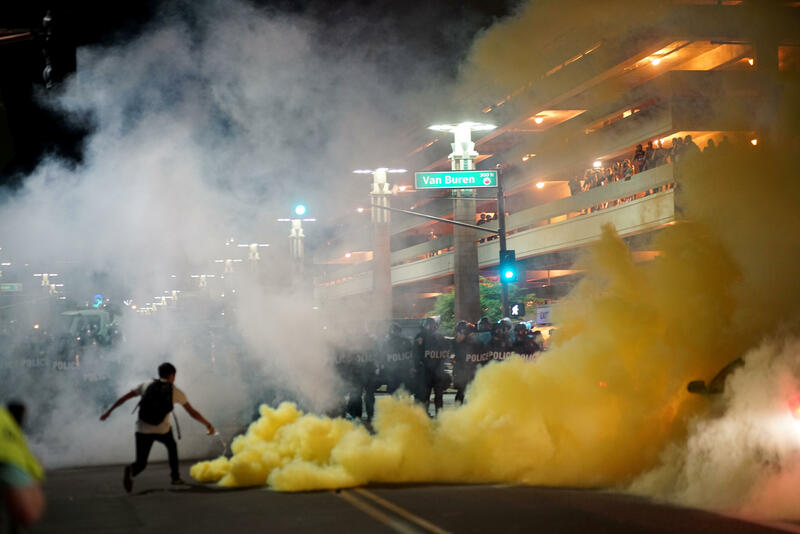 "It was just this thick cloud," KPHO-TV's investigative reporter Morgan Loew on the tear gas. "You really have a hard time breathing." KPHO-TV writes that an organizer of one of the largest protests said his group did not start the violence. "It was peaceful," Carlos Garcia of Puente Arizona told the station. "We started getting shot at by rubber bullets." When asked if the use of force was justified, Williams said, "Absolutely," according to KPHO-TV. KPHO-TV adds that Rep. Ruben Gallego was at the protest and said he needed to talk to protesters, community leaders and police to figure out what happened.